EP-IN-A-DAY 2! THE FIRST 2 VIDEOS! NICK- So last year I failed to get Arts ACT funding for a live-in-studio solo album. As a cheap alternative I organised a one-day session with some of my closest friends and collaborators from the Canberra music scene, and we arranged and recorded four tracks. As an indulgent twist I got Luke to shoot us as we cut the songs live and then make a music video for each. So my plan is to build each #EPINADAY band around a single artist that I’ve always wanted to record with, but in this case there was a slight exception. Matt Nightingale and Jacqueline Bradley can tell you that I nagged them for ages, putting this session off until a date that they had free. Constantly busy, they’ve played a gagillion gigs between them and they specialize in the country/trad style that I wanted to bring to this session, but above all they are the Accompanist’s Accompanists. I’ve rarely seen any musicians so completely adept at serving a song and supporting a lead performer, and between them they seem to play every musical instrument. it was downright luxurious having them take my songs in hand, the arranging of all four songs seemed to take ten minutes. As always Sam King made producing the session while also playing guitar look effortless. It’s at the point now where if I get stumped on an arrangement (which is often) I just throw it to Sam, to the point where he describes his role as ‘producing, guitaring, intros and outros’. Sam McNair was our drummer and while I’d seen his band The Burley Griffin play a bunch of times I actually hadn’t met him before the day. I knew he had the specific genre moves I needed but his skill and versatility went way past my expectations, plus he’s a fun guy. I’ll be hitting him up again in future for sure. Audio-Hunk Nick McCorriston (my collaborator on a bunch of projects as well Tech-Maven for You Are Here Festival) moved back to Canberra just in time to record the session, and the returning film crew of Luke, Shane ‘Crazy-Legs’ Parsons and Adam Thomas were augmented by your-pal-and-mine Ben Lane. I’ll let Luke talk more about their end of it. As usual we did four tracks, the first two are already online. Song To Be Played In The Event Of My Death is the newest song, and therefore my current favorite (songwriters will understand). It was a classic title-first job, the lyrics and vibe are my best attempt to create something that I would actually be happy to have serve as my epitaph. That is to say, it’s very meaningful song to me, which makes the off-the-cuff breezy breathlessness of the take feel all the more appropriate. Wishing is a song I wrote in fifteen minutes and have no facility to critically assess. I always intended to rewrite the lyrics (I suppose to give it a more clearly delineated central metaphor or something) but when it came down to it I realized that I like it just as it is, for better or for worse. Obviously it’s the most ‘country’ track in the session so it was a total thrill to play it with a band that could lean right into the genre trappings. LUKE – For each song of the last EP, we filmed four angles at all times – a wide shot, a close-up on Nick, and two roving cameras picking up shots of everything else. In other words, we played it safe, ensuring we had ‘coverage’. It was our first time attempting such a shoot and I didn’t want to leave anything to chance. It was a blessing and a curse – we had plenty of footage for each song, but it all looked the same. The challenge became editing each video to make it distinct, while still matching the tone and emotions of the song. This time around, rather than necessarily leaving all that to the edit, I wanted to come up with a different filming set-up for each song. That way, no two videos would be alike. It was a bold move – filming without a safety net essentially – but I think it paid dividends. 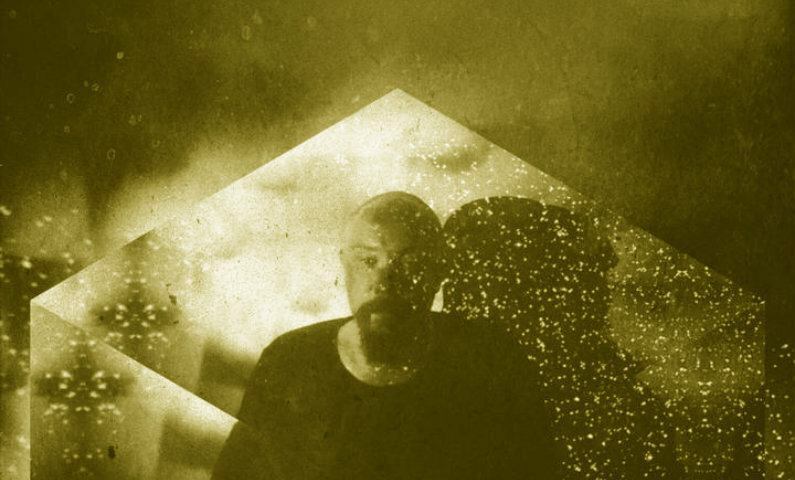 A couple of days beforehand, I ran my ideas for how to film each song past Nick and he was immediately on board – it was another step closer to his conception of making each clip feel like its own autonomous music video. We had a studied looseness to our approach this time which comes out strongest in Wishing. It’s the closest we get to Dogme – all handheld, on location, in colour, diegetic music (of course! ), and with just one small LED light hung above Nick (it’s not truly a Dogme film unless you break one rule). In fact, in contrast to last time, we didn’t use any static shots in any of the videos – everything was shot from off the tripod. Shane – that’s Shane Parsons, camera ninja extraordinaire – arrived earlier than me, and filmed all the beautiful rehearsal footage out in the atrium in front of the studio. I love the behind-the-scenes footage in the video, it gives a sense of the warmth, humour and fun of the day. Having this clip kick off the series provides a nice through-line from the first EP, where the last video also showcased behind the scenes. When I talk about filming without a safety net, Song To Be Played In The Event Of My Death is what I mean. Either we got the shot or we didn’t (full credit to Nick for letting us try). I have long had an idea of filming a ‘oner’ of a band’s performance, rotating out from the centre of the room. I tested the concept at a PROM rehearsal a couple of years ago and loved the results – your eye urges the camera on to the next thing, while at the same time, you hold your breath waiting for the shot to cut away (or at least I do when watching lengthy single takes). Shane’s had some experience with single takes, so I ‘volunteered’ him to shoot this one (I was filming b-roll from behind a corner, but thankfully we didn’t need to use it). The camera is moving so fast, it can be dizzying concentrating solely on the footage. To leaven the effect, I thought it might be neat to throw up the lyrics as subtitles (in stately SBS yellow). That way, your eye bounces between the two things intermittently and the dervish movement is less likely to leave you woozy. A one-take like this also reinforces that the band is really playing the song live, without studio tricks or cheats – it serves as a testament to the skill and polish of the musicians themselves. Whole World Moves Way Too Slow For Me is the last song I wrote for X, and it neatly sums up my views on the creative process. I like to work fast, which sometimes means waiting for collaborators to catch-up; I also value brevity and concision, hence an album of one minute songs or a series of uber-simple cooking videos. 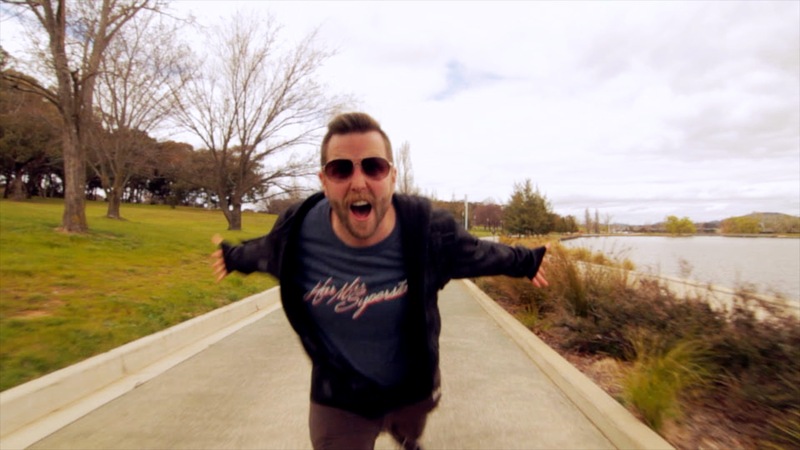 The accompanying film clip required a sense of speed and urgency – running and singing the song in a single take seemed a perfect way to convey this. 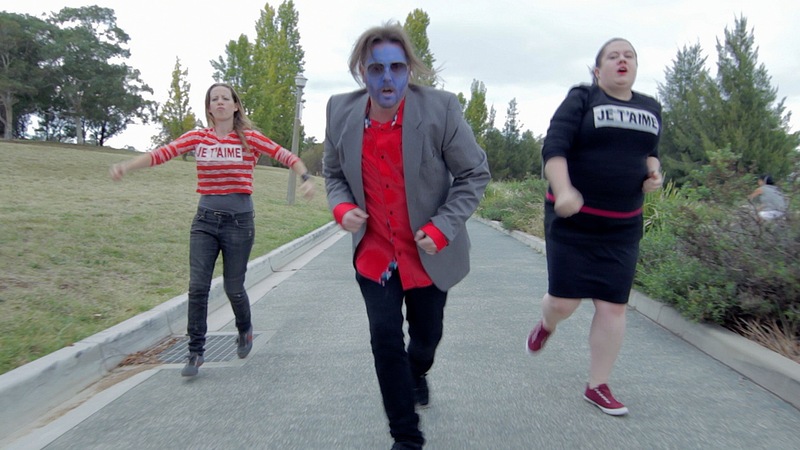 Lou, Matt Borneman and I shot some test footage last year, and discovered our excellent location next to Lake Burley Griffin – a stretch of track just wide enough to use a car as a dolly. Visually, I thought it could be compelling to dress as the iconic Jean-Paul Belmondo in the final scenes of Pierrot Le Fou (it also nods to the band’s Francophile proclivities). I could claim other subtextual conversations are at play (like how Belmondo blows himself up at the end of the film and I collapse at the end of the song), but, really, I just wanted to dress up as Ferdinand! With my hair out and my skin tinted blue, I excitedly found I also resembled Rogan Josh. 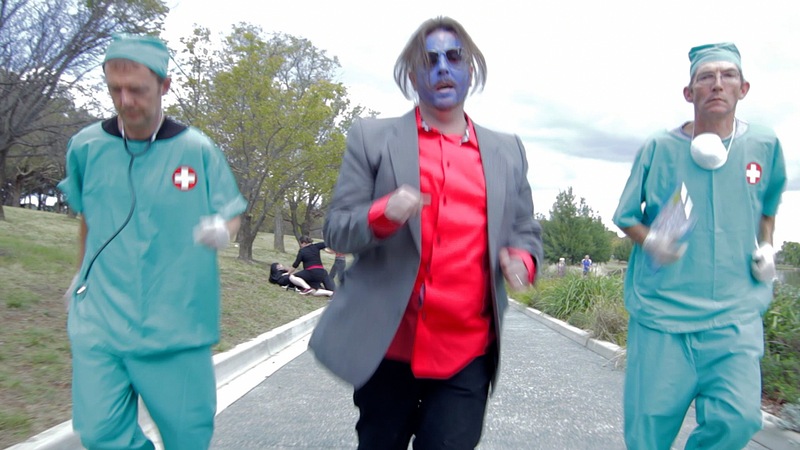 Next, I needed to fill the clip with colourful characters – along with the band, I secured the talents of warrior-poets Nathan Gubler , Nick McCorriston and Cameron Thomas. 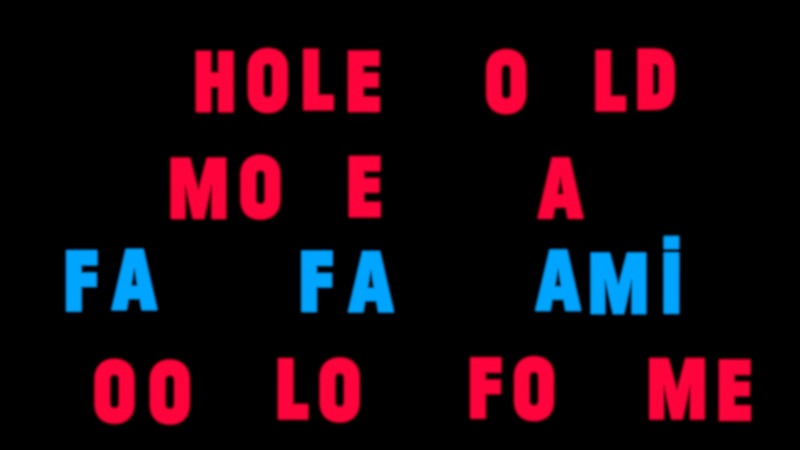 The opening titles are another homage to Pierrot Le Fou – I was even able to find a ‘Godard’ font, created to celebrate his 80th birthday. There’s evident irony in a song about life being too slow… accompanied by a video festooned with references to health and mortality. A personal trainer and his client, a pair of surgeons, and even Death himself all make cameos. I’ll leave interpretations to others, though I will point out I love the cosmic justice whereby I literally avoid and outrun Death (who gets pummeled by Mel and Cath!) only to collapse a few steps later. My collapse happens as two surgeons begin running alongside me. Even funnier is that they don’t actually assist – Darren and Kev came up with their own slapstick routine, which is so good I want to make another clip just based around their antics. The take we use is the fourth – we could have kept shooting and added more elements (or refined existing ones) but this take felt like the right amount of energy and spontaneity. Besides, more takes wouldn’t have been in the spirit of the song! A big shout-out to the unseen heroes of the shoot – Louise McGrath and Kate Hodges, manning the camera and the car respectively. It’s certainly me that you can hear playing the bass parts on the record, but in reality I can’t take much credit for the finished product. Primary credit goes to the production crew of Sam King and Graham Thompson (who is also our drummer) and above all the alarmingly consistent creative vision of Seb, the singer/songwriter/prime mover behind everything that the band is. Here- https://vimeo.com/116835140 – is the promo video to Start As You Mean To Go On (the album’s closing track), which features Seb in an isolated context which for me works as a neat metaphor for the album making process. I’ve been right in that same spot, pushing an artistic vision uphill, assisted by wonderful people but always at the mercy of elusive thing that you can hear in your head, not knowing if you’ll succeed in getting it all the way through to something that exists in the world. The run on nature of that last sentence gives you an impression of the mindset I often end up in, and Seb is far more exacting with his creative vision then I’ve ever been. This has been over two years of Seb’s life, all our lives, but the proof of the pudding is here for all to listen to. This is very likely the most successful artistic endeavor I’ve ever been a part of, and it’s been a wonderful thing to tour these songs around Australia in the last few weeks. If you want to keep apprised of our live shows you can do so here- https://www.facebook.com/CrackedActorAus. If you want a hard copy of the record get in touch with us through our page or just come to a gig!